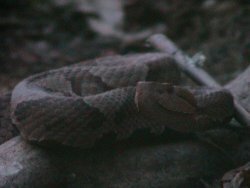 I snapped this picture of a copperhead just before sunset this past summer. Our dog Lucy has an unhealthy obsession with snakes and I had to eventually tie her up on that day so the snake would have time to get away. If you are bitten by a venomous snake there is a 20 to 30 percent chance it decided you were not worth a dose of poison and all you have is 2 puncture wounds. You should calmly start making your way to an emergency room, although if you go 30 to 60 minutes without any swelling or discoloration then you will most likely be fine. It seems like things have changed a bit since I was a Cub scout. The old Lone Ranger trick of cutting the wound and sucking the venom out can actually make matters a lot worse. A cold compress should be avoided because it will cause the venom to stay in that one area which will make skin damage more likely. Do not use a tourniquet for the same reason. First aid kits often have little suction devices, but some experts question how effective they actually are.